Everybody has likely been bullied…or been a bully…at some points in their life. Personally I have been bullied throughout my life, and it really affects your self-confidence for a long time. I am lucky that I have had outlets such as my martial arts to re-focus my energies on and start feeling positive again. However, for you or your child, the outlets may not be so obvious. Therefore, we all need to keep an eye on the signs of somebody being bullied or doing the bullying. the bystanders – this can include increased use of tobacco / drugs / alcohol, depression, anxiety, miss or skip school or work. Physical Bullying – this involves hurting a person’s body or possessions. It includes hitting, spitting, pushing, breaking somebody’s things, or making mean hand gestures. Corporate bullying – is usually repeated and hurtful remarks about you or your work, sexual harassment, exclusion from groups, playing mind games, intimidation, giving pointless tasks that have nothing to do with your job, given impossible tasks, deliberately holding back information, or actual physical attacks at work. Be a role model for those around you. If you treat others with kindness and respect, your children, friends and co-workers will mimic that behaviour. Address the behaviour with the person doing the bullying. Make sure that they know what the problem behaviour is and that it harms others. Respectfully show them that bullying is taken seriously and will not be tolerated. Work with the person to understand some of the reasons on why they bullied in the first place (i.e. they may be trying to fit in, or they may have other things going on in their lives). Use consequences to teach (such as leading a discussion on what it is to be a good friend or write a story on the affect of bullying). Involve the person who bullied to help make amends, so they can see how their actions affect others. Follow up with the person who did the bullying to help them, such as praising acts of kindness. Every single one of us are unique in our own way. Everybody has the right to be happy. Always focus on what makes you special. If someones tries to put you down, they are focusing on you and not them. It is very often not something they dislike about you, but rather something they do not like about themselves. So, continue to hold your head high, because you are worth it. 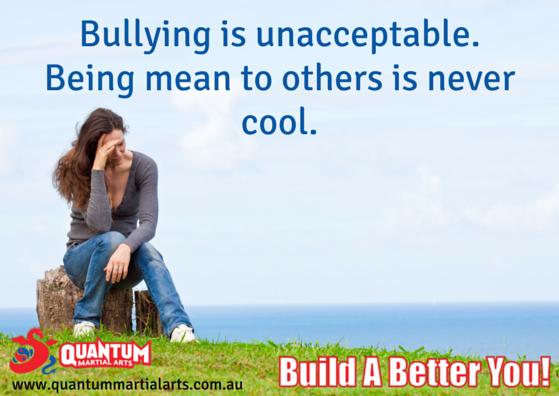 If you ever wish to speak about any matters, including bullying, we at Quantum Martial Arts are here for you. Please let us know if we can help with anything.